Shape of the art. Magnificent stuff. like it a lot! also, what twardy said. I'm a lot more lukewarm towards this. 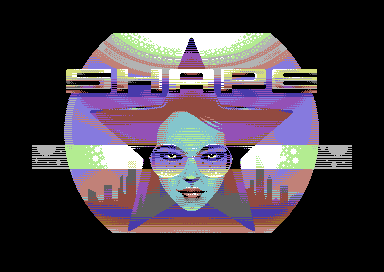 While the graphics are good I'm stylistically into them, cartoony pictures only strike me on c64 in very specific cases. The dots effects midway through was weirdly rendered; I don't know if it was half-baked or suffered from major glitches, but either way I was put off by it due to the blocks and the weird colors on the sides. Soundtrack is a good one too, well produced and all, but ultimately not very memorable to me. Awesome theme, graphics, some nice effects. eXcellent demo, man that was a tough competition! Some superb graphics here + very cool visual transitions. Shape delivers even cleanar and more fine-tuned awesomeness than ever! Love it! one of my favoirit!!! luve the intro!! Nothing technically jaw-dropping, but looks nice. I like the graphics. Very decent demo, but not very memorable, I'm afraid. nice flow, easy to watch and of course awesome pixels. And those tunes are superb!! What a great prod with splendid musics (especially the first SID). rulez added on the 2014-10-28 08:09:29 by w00t! Excellent tunes and sync, esp. in first half. Distinct graphics style and not 20 minutes long. Thumb! rulez added on the 2014-10-30 00:07:17 by JAC! Has a nice rhythm and consistency to it. Great music, great fun, smooth stuff. Will watch again. Great music and art, as well as a good use of effects make this quite an enjoyable production! Great gfx and funky tunes! Good style. Music and Graphics absolutely good! rulez added on the 2014-11-01 23:55:08 by ɧ4ɾɗվ. No my cup of tea. Found nothing new; sorry guys. Great music, great graphics, awesome prod! Yummy. With a fistful of great graphics, code and music. Overall great production. But it lacks a bit that impact from Doors of Perception. page created in 0.023450 seconds with 15 queries.